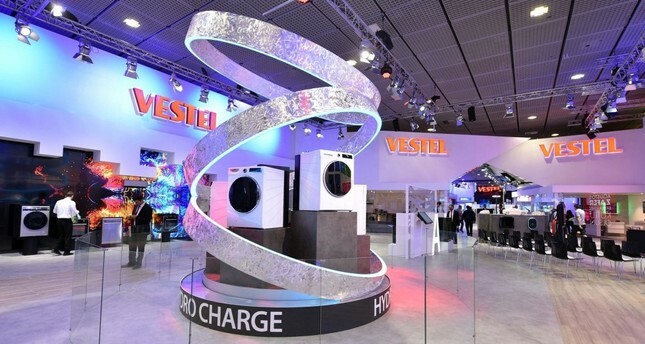 Turkish electronics and home appliances manufacturer Vestel's products exhibited at IFA, the world's leading trade show for consumer electronics and home appliances, in Berlin on Aug. 30. A number of Turkish companies are attending IFA 2018, the world's leading trade fair for consumer electronics and home appliances, in the German capital Berlin. The fair attracts top world tech giants, including firms from Turkey, debuting their latest gadgets and devices, such as smartphones, smart TVs, cameras, smart watches, refrigerators and washing machines. Press conferences held by Turkish global home appliance brand Beko and electronics and home appliances manufacturer Vestel were attended by dozens of local and foreign press members, while their innovative products attracted attention in the international arena. Beko's fast, delicate washing machine, AquaTechTM, was one of the highlights, while Vestel introduced its new yogurt and pickle-making refrigerator. Throughout the fair, the two companies are expected to make the majority of foreign sales connections until the end of the year and plan for the first period of 2019, while foreign companies seeking imports due to fluctuations in exchange rates in Turkey are creating intense conversation traffic with Turkish companies. The fair, which accommodates 1,814 firms and features the latest technologies from mobile phones to refrigerators, takes place Aug. 31 to Sept. 5. Participating in IFA 2018 for the 28th time with 730 products - ranging from smartphones to televisions, from electric car chargers to cookers, from washing and dishwashing machines to drying machines - Vestel stands out with environmentally sensitive products and new technologies. Offering innovations that reduce energy consumption, technologies that leave behind world giants and designs to make life easier, Vestel got full marks from participants. The new refrigerator, equipped with FermentStore technology can produce seven different products, including yogurt, kefir, bread dough and pickles with special heat ratings, while VacumBag technology allows foods to be vacuum packed and stored up to seven times longer. Vestel CEO Turan Erdoğan said: "Now, we are the producer of technology, not the importer. Thanks to these two refrigerators that prolong shelf life, billions of liras worth of food will be prevented from being wasted." "Innovation lies at the heart of competing in the international arena," Erdoğan added. "We made 408 patent applications in 2017, leaving behind the world giants. We entered the top 50 list, once again proving our vision of innovation." Among the leading products displayed by the Turkish technology giant are smart stand system Selette, which responds to users when placed inside 65 OLED TVs, ultra-thin Blatt TV with 4K and UHD resolution, ultra-bright Nina TV with small back cover design, and ultra-narrow framed and thin UHD TV. Vestel also featured washing and dishwashing machines. Dishwashers with EdgeWASH technology that provide 20 percent more washing space in the lower basket, washing machines with Hydro Boost technology, Vestel's artificial intelligence washing machine, the quietest washing machine in the world, new-generation drying machines and dryers with ion technology are among the noteworthy products in this category. With a power output of up to 180 kilowatts, Vestel DC Chargers are able to charge most vehicles in less than 30 minutes, meeting the charging requirements of the market. Vestel's new AC Chargers, ranging from 3.7 to 22 kilowatts, will be available in 2019 in addition to the existing EVC02 Series. Speaking at the press conference focusing on Beko's global success, future vision and innovative products and technologies that make a difference, Bulgurlu said Beko's innovative and intelligent technologies are shaped in light of global trends. "We develop technologies that make life easier, save time and promote healthy living based on consumer insights and new trends. We continue our projects on robots," Bulgurlu said, announcing that an autonomous Arçelik robot, though not Android, will be introduced at the next IFA. Bulgurlu said that although fluctuations in exchange rates bring an advantage for exports, there would be a slight increase in the domestic market.